Traffic congestion costs Denver drivers more than $1,000 a year in lost time, extra gas, and pollution from car emissions. Rush hour traffic, that dog-paddle through molasses you endure to and from work each day, isn’t as bad as all that. Not by a long shot if you live in three of Colorado’s largest metropolitan areas. Denver saw only 36 hours of congestion during peak hours in 2016. That’s 8 minutes and 20 seconds of thinking “What’s the holdup?” per weekday. That’s one of the findings of a study of traffic in 1,064 cities in 38 countries around the globe. INRIX, Inc., a Seattle-based company that provides traffic information and connected driving services in vehicles, online, and on mobile devices worldwide, recently published the information on its Web site. 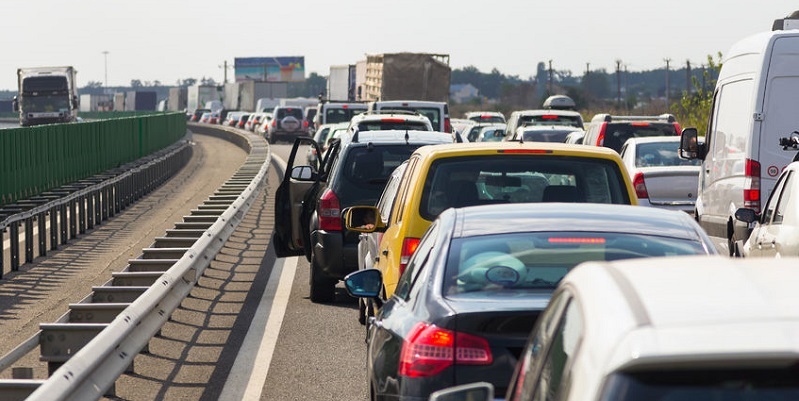 Government infrastructure planners and public safety officials view traffic congestion as more than just an inconvenience, but as one of the greatest causes of aggressive driving, road rage and auto accidents, which cause even more traffic congestion. Road safety has never been a hotter issue in Colorado than now, as we learned that 2016 was nearly a record-setter for traffic fatalities as 608 people died on the state’s streets and highways, a 26.2 percent increase over 2015. In terms of traffic congestion, Denver ranked 21st out of 240 cities across the United States in 2016, 25th out of 310 cities in North America and 107th out of 1,064 cities around the world, the INRIX report says. Denver drivers spent about 8 percent of their driving time in congestion. It earned a 6.4 on the INRIX Congestion Index, indicating that a commute during peak hours will take 6.4 percent longer than a free-flow trip. It’s a big improvement over Denver’s No. 15 U.S. rating in 2009, wrote Mark Harden in the Denver Business Journal. The problem costs Denver drivers $1,180 apiece each year if you count lost time in traffic jams, extra gas costs and “the societal cost of emissions,” he reported. Colorado Springs ranked 80th of 240 cities in this country, 110th on the continent and 496th on the globe. Colorado Springs drivers spent about 6 percent of their driving time — about 15.5 peak hours — in congested traffic in 2016. Index score, 3. Pueblo drivers have a reason to be mellow. The city ranks 207th in the U.S., 275 in North America and 948th out of the 1,064 cities measured worldwide. Pueblo residents spent only 3 percent of their driving time in congestion, about 6.5 hours all year long. That’s about 90 seconds every weekday, an astounding 1.4 index score. If you want to feel better about a few minutes of gridlock, just think of the poor souls in Los Angeles, who endured 104.1 hours of infernal traffic jams in 2016. That’s about 24 minutes of frustration, rubber-necking and reading bumper stickers every weekday. Los Angeles and its legendarily bad traffic jams ranked No. 1 in the U.S., North America, and the world. Drivers there spent about 13 percent of their driving time in traffic jams in 2016. They score an 18.6 in the ICI index. New York City, by comparison, ranked second in the U.S. and North America and third in the world, according to INRIX. Drivers there spent about 89.4 peak hours in traffic congestion in 2016, or about 13 percent of their time driving. New York’s index score was 17.4.